Waterford became a township in 1834, three years before Michigan became a state in 1937. In 1819, two men and their families by the names of Oliver Williams, and Alpheus Williams came from Massachusetts to buy land in Michigan, and they ended up in present day Waterford Township. Alpheus was Oliver’s Brother and law, and they made the first land purchase, which costed them around $2.00 and acre. Alpheus Williams and another man by the name of Archibald Phillips purchased a total of 161.40 acres, which became known as the village of Waterford. The Oliver Williams family would settle on Silver Lake, which in now near the intersection of Silver Lake Road and Walton Boulevard. Alpheus Williams and Archibald Phillips would settle and build their home where the Clinton River crosses the Saginaw Trail, which is present day Dixie Hwy and Andersonville Rd. The two men built a sawmill in the area, and the village of Waterford was formed (Waterford Township Historical Timeline, 2011). Waterford is also where the first school session took place in Oakland County. It occurred in Oliver Williams’ sheep barn in 1821 where seven students attended class. A schoolhouse was built the following year in 1822. 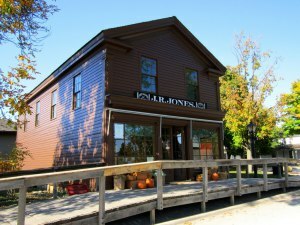 One building in particular from the Waterford Village is Jacober’s General Store, which currently in Greenfield village. It was the first building moved to Greenfield Village and is a good representation of what a general store would have looked like in the Detroit area in the mid to late 1800s. Henry Ford bought the General store off of the owner for $700. This general store had a ballroom upstairs as well (Greenfield Village Open Air Museum, 2008). With the advancements in transportation such as railroads, Waterford in the late 1800s was often used as a resort for many people. It was still considered up north at the time, and many people build cabins on the lakes. It was a great place to vacation and get away from the city (waterfordhistoricalsociety.org).